Badan Amil Zakat Nasional – BAZNAS is the National Zakat Agency of Indonesia. BAZNAS is the official and the only one agency in Indonesia which was formed by the Government of Indonesia with main duties and functions to collect and distribute zakat, infaq, and alms (ZIS) at the national level. BAZNAS was formed in 2001 under the Presidential Decree No 8 of 2001. 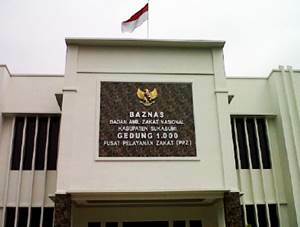 BAZNAS is a non-structural government agency in Indonesia which is independent and accountable to the President of Republic of Indonesia through the Minister of Religion. BAZNAS has its legal domicile in the state capital Jakarta and its head office is registered at Jl Kebon Sirih Raya No 57 Jakarta Pusat 10340. At present, BAZNAS supported by 33 BAZNAS provinces and 1 Baitul Maal Aceh. According to BAZNAS’s profile as cited by JobsCDC.com, BAZNAS now has 101 Zakat Collecting Units (UPZ) spread across Indonesia. Final year students, fresh graduated, or those who have maximum 2 years of experience. Good looking, well-mannered, and syar’i. Confindent and have strong communication skills. Have a good marketing skills. Willing to work on specified shift. Willing full time during the first month of the employment contract, and is willing to go in at night feast. Willing to be placed in Jabodetabek. Willing to abide by rules and regulations BAZNAS. Have own motor vehicle and SIM C and familiar with the Greater Jakarta area for JZ position.